Whether you are striving to research new simulation methodologies or develop innovative product designs, use of MSC software can help you achieve your goals. When using our industrial-strength simulation software for your research and development (R&D) work, you don’t have to worry about hitting any walls or capability limitations. Our Academic software products are identical in functionality to our Commercial products. That means you can use the same great computer-aided engineering (CAE) software that is used by the best companies in the world on the most complex products being engineered today. Our Academic Software Offerings enable you to virtually prototype product concepts that have never been considered before – the number of What-If scenarios you can perform is limited only by your computing hardware and time. Whether you are doing finite element analysis or motion dynamics & system simulation, our Academic Structures Bundle and Academic Motion Bundle, respectively, can help you extend our commercial, off-the-shelf codes by connecting your own simulation codes and intellectual property (IP) through subroutines, scripts, and open frameworks. Orthopedic Research Laboratories has enjoyed an excellent working relationship with MSC.Software over the last fifteen years. Sales, licensing, ans support staff at MSC have consistently demonstrated their culture and fairness and service. Out laboratory has utilized advanced features in both Marc and Adams to create robust comparative studies of artificial knee replacement wear performance. The predictive capability of these computational models has been validated by recent clinical retrievals. The development of these high quality models would not have been possible without access to the deep technical support people at MSC. Not surprisingly, many researchers have long used MSC software in established and emerging fields – such as biomedical devices & procedures, aircraft & spacecraft design, vehicle engineering, analysis of machinery, robotics, mechatronics, alternative energy (e.g., wind), the safety & stability of civil structures, elastomers, composites, multi-scale modeling, abstract modeling, and design optimization, among many others. American Institute of Aeronautics and Astronautics (AIAA) using keyword "nastran"
SAE International using keyword "adams"
You can also search through academic papers presented at MSC VPD conferences (on virtual product development) and read our research-focused academic success stories such as those from the Massachusetts Institute of Technology (MIT), Rush University Medical Center, University of Alabama in Huntsville Rotorcraft Systems Engineering and Simulation Center, Devers Eye Institute, University of Southern California (USC) Dental School, and Texas A&M Biomedical Engineering Department. Academic Structures Bundle: Provides linear and non-linear finite element analysis (FEA) capabilities for structural & thermal simulations as well as others such as those involving impacts and fluid-structure interactions; based on the latest versions of MSC Nastran, Patran, Dytran, Marc, and Sinda. Academic Motion Bundle: Provides capabilities for a wide variety of multi-body motion and mechanical system simulations, including hydraulics & controls, using a geometric modeling approach or a schematic, block-diagram modeling approach; based on Adams and Easy5. Academic SimDesigner Bundle: Provides CAD-embedded FEA and Motion simulation powered by MSC Nastran, Marc, and Adams in CATIA V5. Academic SimXpert Bundle: Provides fully integrated multidiscipline simulation solution. It brings together end-to-end multidiscipline simulation capabilities and best practice methodology capture and deployment technologies in a single unified environment. 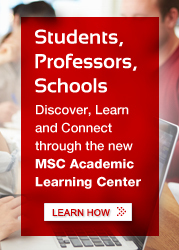 Sign up to receive updates about MSC.